Lanai Pineapple Address Plaque - - 3 line metal address sign personalized with the house number and street name you provide. Made in USA. 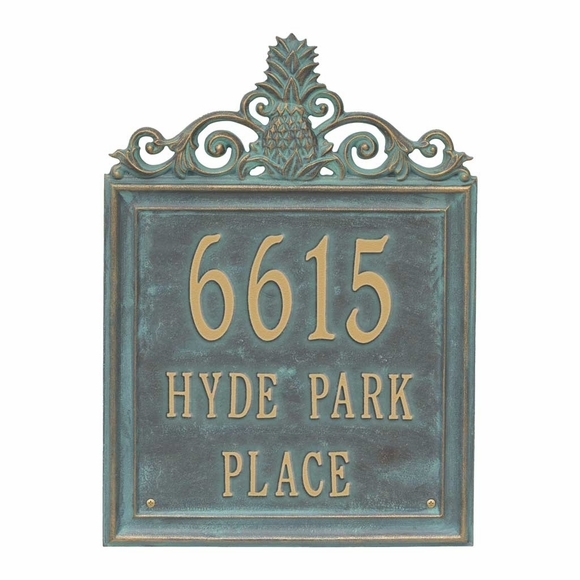 The detailed pineapple surrounded by filigree accents adds a formal tone to this classic square address sign. Lawn mount with purchase of optional lawn stakes. Standard 11"x11" square; overall size with pineapple topper 11"W x 15"H.
Large 14"x14" square; overall size with pineapple topper 14"W x 19.4"H.
Standard sign holds up to five (5) 3" house numbers on Line 1 and ten (10) 1.25 street name characters on Line 2 and 10 more characters on Line 3. Large sign holds up to five (5) 4" house numbers on Line 1 and up to ten (10) 1.75" street name characters on Line 2 and 10 more characters on Line 3. Please follow format shown in sample signs for street name Lines 2 and 3. Manufactured from high-density cast aluminum alloy. Seven eye-catching color combinations: antique copper, black/gold, black/silver, bronze verdigris, oil rubbed bronze, bronze/gold, pewter/silver. Large image color: bronze vertigris. Smaller images (from left to right): antique copper, black/gold, black/silver, bronze verdigris, oil rubbed bronze, bronze/gold, pewter/silver. Dimensions: 11"W x 15"H x 0.375" or 14"H x 19.4"H x 0.375". Lanai, an island in central Hawaii, has long been associated with pineapple production. Made in USA.